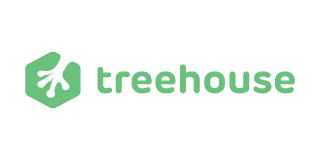 Check out our Treehouse review, the leading learning site for developers. Check out the pros and cons and how they compare with the competition. Treehouse is a learning platform dedicated entirely to technology skills. They have classes that cover topics like website construction, coding, and app design (primarily for iOS), and there are two subscription options depending on your needs. The basic plan runs you $25/month, and gives you access to all 1,000+ video courses and interactive tools. One of the biggest benefits of Treehouse, however, is their Code Challenge Engine which allows you to practice writing and running code, and this feature is only offered in their Pro Plan which costs $49/month. Also included in the Pro tier are exclusive bonus content, special forums, and the option to download video for offline learning. Ryan Carson founded Treehouse in 2011 as a spin-off of the video-tutorial service of his previous company, Carsonified. The name was chosen because it “reflects the wonder of learning as a child,” the type of learning Carson hoped to inspire with his new site. Today, Treehouse has served 290,000+ students worldwide, and is available either through their website or iOS and Android apps. To write this Treehouse review, we took a look at how classes work on the site. Even more than most subscription-based services, Treehouse doesn’t let you see much of anything without signing up for at least the basic plan, but fortunately, there is a seven-day free trial which can give you access to the features of either package in order to check it out. When you sign up for a membership, they will ask you a series of questions about your reasons for joining the site, and then you will get a personalized recommendation of where to start your learning. If you don’t like their suggestion, you can go and browse the full list of tracks. Tracks include a set of related courses and vary in length from just a couple of hours to over sixty. You also have the option to choose an individual class or workshop from the library, each of which is rated by difficulty level. Classes are entirely video-based, include no assignments, and do not offer certificates of completion. With the Premium membership, there are coding challenges through the Coding Challenge Engine which serves as practice activities, but these are not available in the basic package. In terms of making your success, activity on the site earns you “points,” but there is no clear purpose for the points beyond gaining status within the site itself. NOTE: There is a third membership level called Techdegree which offers a full curriculum, graded projects, a final exam, and a Treehouse certification. These programs were launched less than two years ago, and there are currently six options, each requiring hundreds of hours to complete (varies by program). While this feature overcomes many of the weaknesses of Treehouse, it is not one of the standard subscriptions, and it costs $199/month, so is not comparable with the other sites listed here on Crowder. The conclusion of our Treehouse review is that this site has some interesting features, but it isn’t our top choice for online learning. Firstly, it just has a very limited scope, being a good fit only if you want to learn coding and nothing else. In terms of pricing, it’s also a little high given the number of courses available, and you have to pay twice as much for the Premium membership if you want access to the coding engine. The Coding Challenge Engine is the biggest draw to use Treehouse over other sites to learn coding, and it has some really great features, but depending on your needs, you may be equally happy with a free code simulator, so it’s worth doing your research before you jump into paying. Our biggest positive for this site is that because it is so completely focused on one area, you can use the site to network with others who are in web development and coding. Treehouse is definitely not a bad choice for online learning, although it might be not the first option for most. Be sure to check out the alternatives on our comparison page.